Another decent day of weather was forecast so we decided that a walk up to Great End was long overdue, it hardly seems like it but we last stood on its summit was in 2007, so how did those ten years go by without us noticing? Worse than that is the realisation that you are ten years older too, but its probably best not to dwell on that thought too much. We had something of a surprise (shock?) when we arrived in Seathwaite and saw that boulders had been placed at intervals along several sections of the road sides so parking along here is now somewhat restricted, and which will no doubt be a cause for concern come the holiday season. The boulders were not here in August 2016 and the work looks relatively recent but there was no signage to indicate who did it and why so whoever they are they are keeping a very low profile, perhaps they don’t want to be inundated with complaints from disgruntled walkers. More boulders at the farm end of the lane, probably stretching back about 200 yards from the turning point just before the farm building, that’s a lot of parking spaces gone for good I suppose. We were still mulling over it all as we headed along the track towards Stockley Bridge, Seathwaite Fell up ahead of us with Greenhow Knott and its familiar cluster of trees. Then we got to remembering the times when we had got a good old soaking up here, the first occasion being when I hadn’t taken a shot of the bridge on the way up thinking I would do it on the way back only to walk the whole way back down Grains Gill in pouring rain, so no photos then. The very next day there was an agricultural show on in Rosthwaite so we went over and had a look at that, then had a walk up and down Castle Crag and before setting off back we walked up to the bridge to take the photos we hadn’t taken the previous day. We had just reached the bridge with the camera emerging from its case when the heavens opened once again. I took a couple of quick shots then we walked the mile or so back, arriving at the car looking like a couple of drowned rats. The third drenching occurred after we had walked down the Styhead Gill path in constant drizzle which, by the time we reached Greenhow Knott, had stopped and the sun was blazing down. We took off the waterproofs while we were at the Knott, stowed them in our packs and started downhill towards the bridge and the path back to the farm. We were halfway down when we saw the downpour hurtling towards us down Grains Gill and we were soddened yet again. Oh happy days! No wonder its on record as the wettest inhabited place in England. It hasn’t been the wettest place in England lately though and the water flowing over Taylorgill Force is testament to that. The lack of rain during the past few weeks has reduced it to a mere dribble in comparison to what it usually looks like. There wasn’t much of a flow of water down Grains Gill either …..
….. and a look back down the valley from the other side of the bridge reveals an almost dry river bed. Looking ahead as we climb up to Greenhow Knott with Base Brown towering above it. The lady walker in front came by us at the gate beside the bridge, she was dressed as if it was the depths of winter which surprised me because, although it was a mostly dull and grey morning, it really wasn’t all that cold. 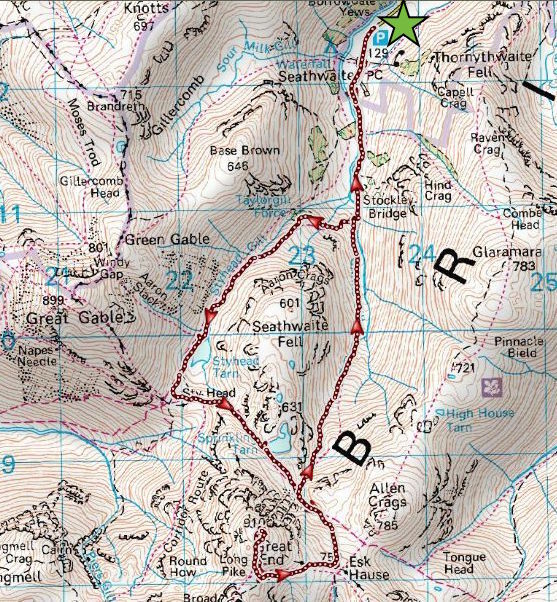 We exchanged pleasantries as she passed, and she asked us if we were going to Scafell Pike, we replied that we weren’t and were only going as far as Great End today. After that she hared off up the path like there was no tomorrow so I assumed she was going to Scafell Pike and wanted to be getting on with it. We eventually lost sight of her at Styhead Tarn. A brief sunny spell on Greenhow Knott, and no thunderous roar from Taylorgill Force either, as I wait for the other team member to catch up, the injured foot & leg is still not very nimble so they have to go at a very steady pace. The young lass in pink behind was running up which didn’t help matters. A look back along Borrowdale as we pause to rest the leg for a moment or two. There’s a lot of thick haze about today and, although we get the odd sunny spell every now and then, a lot of thickish cloud too. The lady in red, who came by us at the bridge, is up ahead, although she is a little further away than she seems because I zoomed in a little to get a closer look at Green Gable. The great hulk of Great End, to the left, keeping an eye on Styhead Tarn. It was Mars Bar o’clock so we had a short break here while someone tucked into one, it wasn’t me because I don’t like them. The lady in red had just disappeared over the rise in the path over to the right and a bunch of blokes came by and decided to have a short break here too. One of them apologised for all their chatter, which was considerate of him, but it wasn’t really loud or bothersome. They were just a bunch of fellas out together for the day, in high spirits and no doubt putting the world to rights while they were about it. A closer look at Great End, and no you don’t have climb up the front of it, although I suppose you could if you felt like it. Being made of lesser stuff we will be using the path which runs in front of it and then sneak up on the summit from round the back. That’s not exactly a piece of cake either but its a whole lot easier than the full frontal method. Another few seconds of sunshine drifted across Styhead Tarn and we’re now feeling a nippy little breeze to. Thankfully its only the hair ruffling type and not the blow you off your feet variety. Another craggy monster. No, not the guy beside the stretcher box, the big lump of rock behind him called Lingmell Fell with the deep gash of Piers Gill slicing through its left hand side. We were last up there in 2008, we really must get out more! A closer look at the stretcher box with the walker sitting beside it looking for all the world as if he was in need of some of the equipment stored in the box, or maybe he was just meditating, who knows? All I know is that he didn’t move all the time he was in view. We turn left, away from the stretcher box, and pick up the path which will lead us up to Sprinkling Tarn and across the foot of Great End. Immediately before us, from left to right, are The Band, the deep gash of Skew Gill and then Great End itself. We enjoyed another brief, but welcome, spell of sunshine which all too quickly …..
….. vanished, leaving us in another spell of gloom. There was nothing gloomy in the small encampment down there by the tarn because we heard plenty of chatter and laughter coming up from it. I looked back to see if Great Gable and Green Gable had managed to catch a spell of sunshine, but no, they hadn’t and the poor light was doing nothing to help matters either. We decided that it might be pleasanter to have something to eat here by Sprinkling Tarn rather than wait until we were up on the probably breezy expanse of Great End summit, especially as a large patch of blue sky turned up just as we arrived. We have a view of Glaramara and a hairy hiker who bellowed a cheery greeting on his way over to Seathwaite Fell. Crocodile Dundee sprang to mind. We settled ourselves on the grass, to the left, with our backs to the rocks and left the world to fend for itself for twenty minutes while we enjoyed the food, the shelter from the breeze, the sunshine, the peace and quiet and the view of Allen Crags. All packed away and ready to go again now, with a good view of the lumps and bumps of the Allen Crags to Glaramara ridge as we make our way back to the path. Overhead is the large patch of blue sky we’ve just been enjoying. The path we need is the one to the right which is snaking along below Great End’s craggy face. The path running along the little slope just above the small tarn is the Grains Gill one we’ll be using for our return journey. Passing below the formidable crags and gullies of Great End, which people do climb for fun and enjoyment. My reason for not doing so is that I’m far too old for that sort of thing, so there. Even when I wasn’t far too old I wouldn’t have been doing it, but I can’t think what my excuse would have been that far back. A look along Ruddy Gill up to Allen Crags as we pass by. It wasn’t looking very ruddy or very much like a gill with just the odd puddle of water hanging around here and there. Good thing we didn’t need to fill any water bottles. We’re still sneaking past the crags but you just can’t help taking a look up at them now and again. We still have a lot of cloud overhead as we reach the Y junction in the path. We follow the path on the right but we could just as easily have taken the left hand one, they would both bring us out on the Esk Hause path. The one we took simply cuts off the corner, every little helps as they say, especially when you have an aching foot and leg. This gives some idea of just how hazy and poor the visibility was today. You can just about see the Skiddaw range on the skyline with Derwentwater below it but it needed a fair bit of effort to distinguish anything. Over on the left, in front of Skiddaw, High Spy is lucky enough to be in the sun for a while. At last, after looking back dozens of times, I get to see Great Gable and Green Gable with some light on them. Even the long grassy sweep from Green Gable to Base Brown is illuminated a little. I always enjoy looking at that long and graceful slope over to Base Brown, but walking over it is not as easy as it might appear. Its steeper than it looks, it seems to go on forever, and sometimes it can feel as if you’re never going to get to the top of it. We’re still making our way over to the Esk Hause path and its still gloomy over Allen Crags, but it does look as though the heavy cloud is beginning to break up at last. However …..
….. that doesn’t mean that things have improved very much. Even in close up the Langdale Pikes lack definition and the view beyond them isn’t worthy of mention. At least we’re close enough to Esk Pike for a decent shot of it. There didn’t seem to be a lot of takers for the walk up to the top …..
….. as most of the walkers out and about today were heading up this path, probably on their way to Scafell Pike. We’re going that way too but eventually we’ll break off to the right and make our way across to Great End summit. A chance to look across Eskdale as we make our way over to Great End. Harter Fell is prominent, but indistinct, on the centre skyline. Nearer, and a whole lot clearer, we have Ill Crag on our left as we climb up to the ridge line. Below the path, on our right, was this cross shelter sited in Calf Cove …..
….. there it is at the bottom left and quite a way down from the path. I began to wonder if it ever gets used, especially as there is another one lower down the path close to Allen Crags. Another splash of sun hits the bouldery slopes of Great End and immediately makes everything look a whole lot more cheerful. We’ve reached the ridge line now and before we head over to Great End summit we have a chance to look across to Ill Crag on the left with Broad Crag on the right, and Scafell Pike just appearing on the skyline between the two of them. About a mile to the south east of Great End is England’s highest point, Scafell Pike, which is drawing walkers towards it like iron filings to a magnet. I could see some of them through the viewfinder with the camera on zoom, through the binoculars it looked as though a works outing had just arrived up there. From the approach to the summit of Great End I took a look back at the route to Scafell Pike crossing the flanks of Ill Crag. Zooming west to the Langdale Pikes and beyond where the gloom and the haze continues. On a better day the views from Great End, at 2984′ above sea level, would be phenomenal. As things stand the only decent views we have are those of Allen Crags immediately below us …..
….. and the one along the ridge to Glaramara, where the sunlight dappling at least adds a layer of interest. To the west, across the gash of the Central Gully below, things become smokier, with Great Gable in the centre and Green Gable to its right. To its left is the flat top of Kirk Fell and the arching silhouette of Pillar. Best of all is this breath-taking view over Sprinkling Tarn and Seathwaite Fell, along the length of Borrowdale and on to Derwentwater with the Skiddaw range providing the full stop at the end. I had almost given up hope of taking a shot of this when, as if by magic, someone switched on the light and the entire panorama just came alive for just a few moments. As the summit had been taken over by a walking party of fifteen folk I continued wandering around the summit area to see what else I could find. As is obvious, walking across the top of Great End is hardly straightforward, but I made it this far without twisting either ankle for this shot of Scafell Pike and the col connecting it to Lingmell Fell. Amazingly enough Seatallan, far away over on the right, manages to rise above the general murk to make its presence known clearly enough. A quick look back confirms that the walking party is still in residence at the summit cairn so I wandered westwards for a peek into Mosedale with Pillar on the centre skyline, below it is Kirk Fell and in front of that is the familiar hump back of Great Gable. I made my way back towards the summit cairn where the walking party was still hanging around doing nothing very much other than crowding everyone else out, and on the way over I spotted a sunlit Glaramara nicely framed by the precipitous walls of the Central Gully. Right, I’ve had enough of hanging around and waiting for the walking party to depart, and I reckon they’ve had quite enough time up there so I walked straight across to the summit …..
….. and climbed up, at which point the guy who had been standing on this very spot from their moment of arrival until now, a period of a good fifteen minutes, had little option but to shift off his podium and make room. I am not normally rude or pushy but my bucketful of patience was running on empty. Get to the summit, take your photos and then clear off so other walkers may do the same is our philosophy. Now that the area is clear there is plenty of room for manoeuvre and he’s determined to get up there no matter what the injured leg thinks about it all. Made it, and a brief pause before clambering back down again. The walker in pink is the last of the stragglers from the walking party, the rest of them have headed off left out of shot. The view northwards from the cairn, the clouds are breaking up, the sun is out, the breeze has eased slightly, the temperature has risen by a couple of degrees in consequence and its just grand to be up here. Summit time comes to an end and we join the all Scafell Pike returners and begin the long trek back, in the full knowledge that progress will be slow as the injured leg still isn’t happy going downhill, and its also now very tired after the exertion of getting up here …..
….. perhaps the view of a sunny Allen Crags will take the mind off an aching leg. Its turning into a very pleasant sunny afternoon as we make our way down to Ruddy Gill. Slowly and carefully for the recuperating leg since its a bit like walking over ball bearings along here. Turning down into Grains Gill with a sunlit descent path stretching out before us. The path is pitched with good firm rocks for a good part of the way down, which is good for the foot, but further down the ball bearing surface re-appears together with a couple of awkward spots to clamber over, which isn’t so good for it. We had the sun on our backs all the way down which was very agreeable up here, but it did get very warm the lower down the valley we went. A close up of the view ahead while I still had the height and the haze seems to have thinned out very slightly, now we can make out a little more detail on the Skiddaw range than we could this morning. A longer view of the previous shot showing just how far we still have to go before we reach the green fields down in Borrowdale. The recuperating foot and leg are getting very weary now but at least the path is still a help rather than a hindrance. Back at Stockley Bridge again where we stop for a few moments to quench our thirsts, and also manage to spray our trousers, with a couple of very juicy Clementines, and just watch walkers crossing over on their return to Seathwaite. The view up Grains Gill is a whole lot brighter and clearer than it was this morning, what a lovely afternoon it turned out to be after all this morning’s gloom. It only occurred to me after we were on the move again that we should have given the aching foot a dip in this very inviting pool just below the bridge, soaking it in the cold water would have been very soothing and cooling at this stage. I clambered over the rocks below the bridge for a view upstream where the amount of water flowing down is nowhere near what it is normally. Seatoller Fell ahead of us, dribbles of water trickling through the beck stones alongside us, and a very dry and dusty path leading us back to Seathwaite Farm. Back at Seathwaite Farm with some of the crags of Thornythwaite Fell behind it. The afternoon is drawing on, walkers are still returning down the track, some already making their way back to their vehicles, while others are off-loading their rucksacks and changing their boots. The recuperating leg and foot have walked just under ten miles and, here and there, over some quite rough and testing paths which, considering that four months ago they were broken in three places and had to be pinned and plated back together, is no mean achievement. Their owner is well chuffed if rather weary!